Arkansas offers a little bit of everything. It boasts the banks of the Mississippi, the Ouachita and Ozark mountains, and lush forests and fields in between. In terms of topography and ecology, these lowlands, highlands, timberlands, and farmlands make Arkansas one of the more diverse states. Any state dubbed The Natural State has a good reason to switch to renewable power sources, such as solar energy. In terms of weather, Arkansas receives a great deal of precipitation and experiences plenty of stormy weather. Summers are hot and humid, while winters are cool and drier. Conditions are fine for harnessing solar power, but the state is resistant to legislating progress in this area. 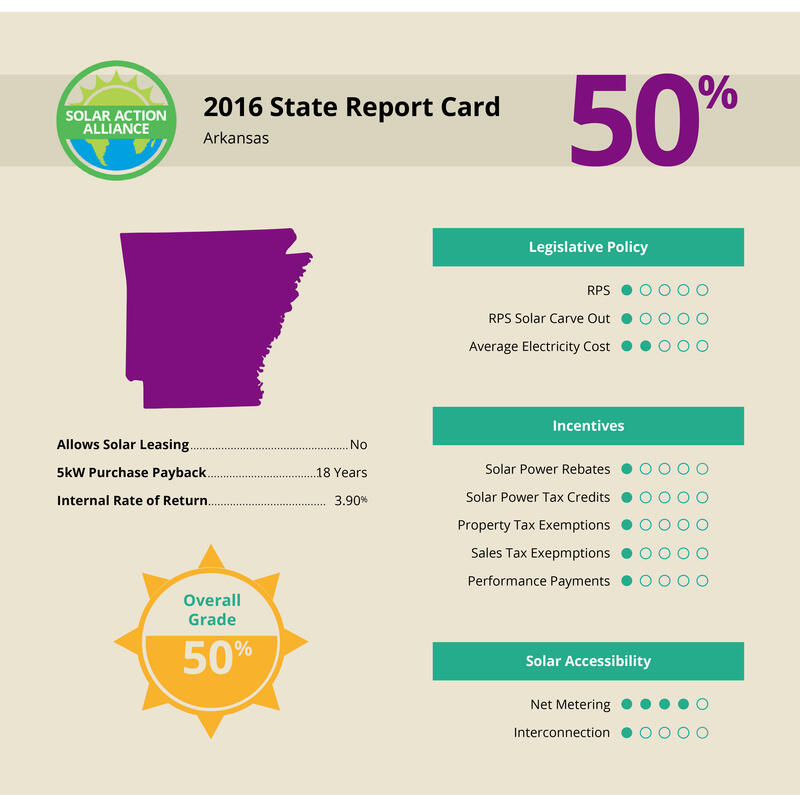 Politics aside, it’s still worth your time to investigate the benefits of going solar in Arkansas. Back in 1977, solar power cost was too excessive to be practical. 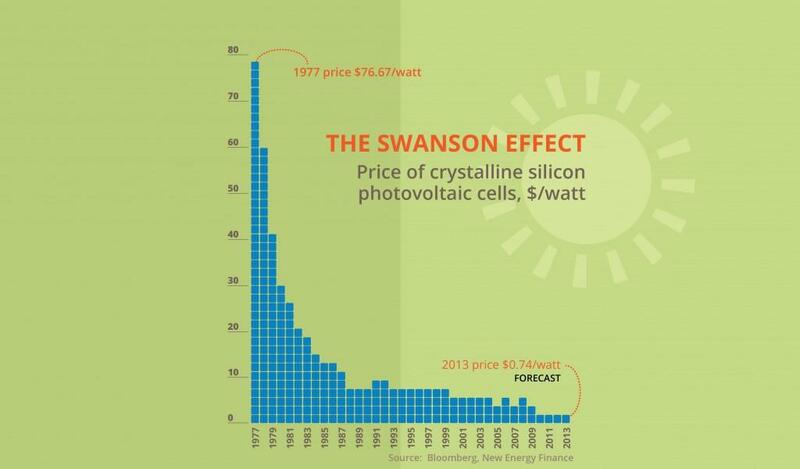 The graph below depicting the Swanson Effect demonstrates how much costs have dropped since solar energy first became usable. As the technology continues to improve, per-watt prices will most likely drop even more. So let’s take a closer look at what your return on investment (ROI) might actually be for installing solar panels in Arkansas. Arkansas is one of the few states where paying for solar panels with loan funds is not profitable. Whether you purchase a full-size system or a smaller one, you’ll barely break even after 25 years. 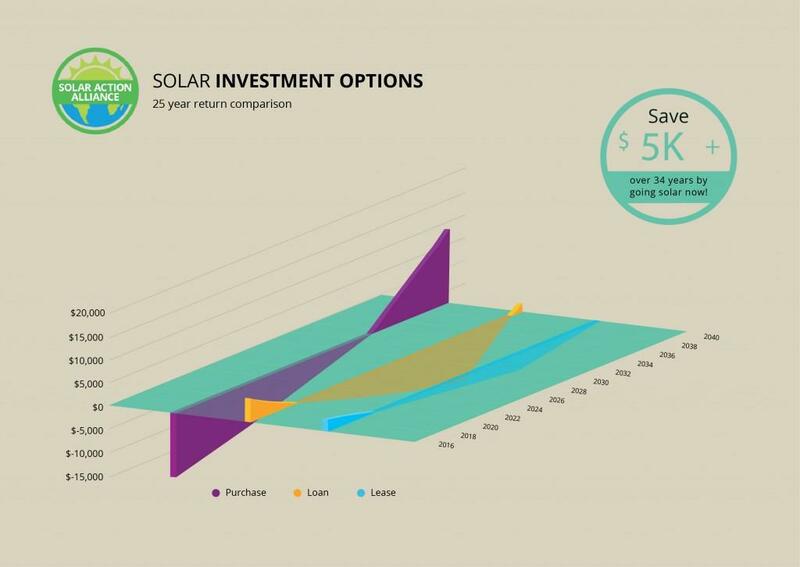 The only way to make a solar energy system a solid financial investment is to purchase such a system outright, but that will initially set you back over $21,000. Sadly, in this situation, only the wealthy can get wealthier. Why is this the case in Arkansas? For starters, electricity rates are among the lowest in the nation, so switching to solar doesn’t save as much money as it does in most other states. Additionally, Arkansas offers no strong incentives for converting to solar energy. So the only real bonus is the 30% federal tax credit you get during the first year after installation. However, if you’re interested in preserving the state’s natural beauty and doing your part to save the environment, you can certainly explore the loan avenue in more detail. Let’s look at three payment options for purchasing solar panels. If you have enough cash to buy a solar power system, then using your own money to make the purchase is really the only option that makes sense. You’ll own the system from the first day, receive a large federal tax credit, and start seeing savings on your electric bill right away. 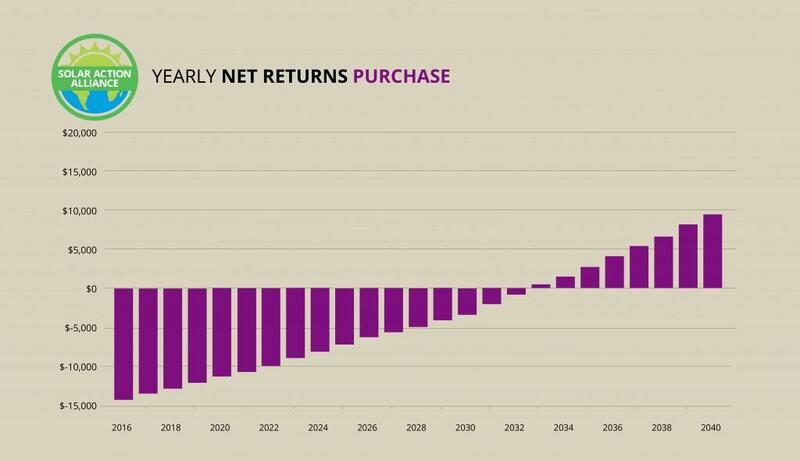 Looking at the graph below, you can see that a purchase price of approximately $21,000 “only” leaves you in the hole $14,000 after year one. Again, that’s because of your 30% tax credit from Uncle Sam. Over the next 25 years, your savings will compound to the point where you’ll actually earn almost $10,000. While that’s not shabby, buyers can earn far more in states that have higher electricity prices and more financial incentives to go solar. Loans for solar panels are great options for residents of many states. But in Arkansas, low electricity prices equate to less savings when converting to solar power. Still, if you qualify for a home-equity line of credit (HELOC) to cover the purchase of the solar panels (a little over $21,000) and can get a fixed interest rate of 5% or less for 15 years, you might find the loan option worthwhile. You can see how you’ll start to get ahead by referring to the graph below. Without putting any money down, you’ll still receive the federal tax credit. After that, however, your loan payments will outweigh your energy bill savings. 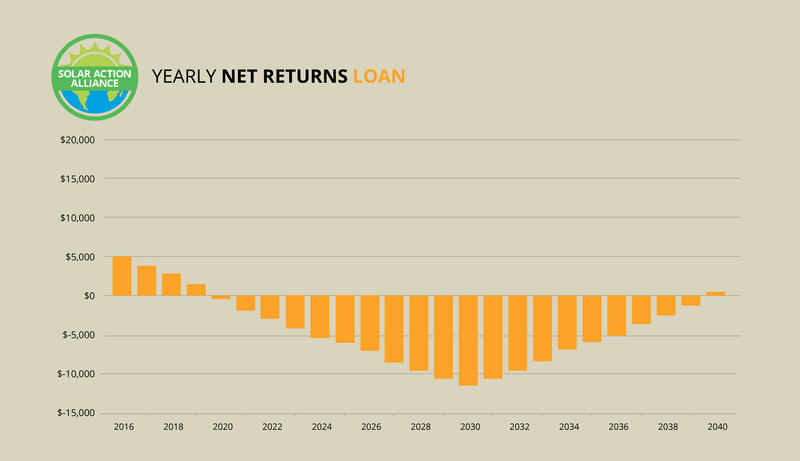 Things change during the last 10 years of your loan. Without any loan payments, you’ll save more money as grid electricity costs rise, as your expenses will remain about the same. Ultimately, you’ll earn back the money that you spent on the loan, but you’ll be left with barely more than pocket change. If you don’t have $21,000 worth of home equity, you can get a smaller loan and install a smaller solar energy system for your residence in Arkansas. You won’t end up in the black, but you’ll help the planet end up in the green. Let’s say you install a 2kW rooftop solar panel system for about $9,500, and you pay for it with a HELOC at 5% interest over 15 years. 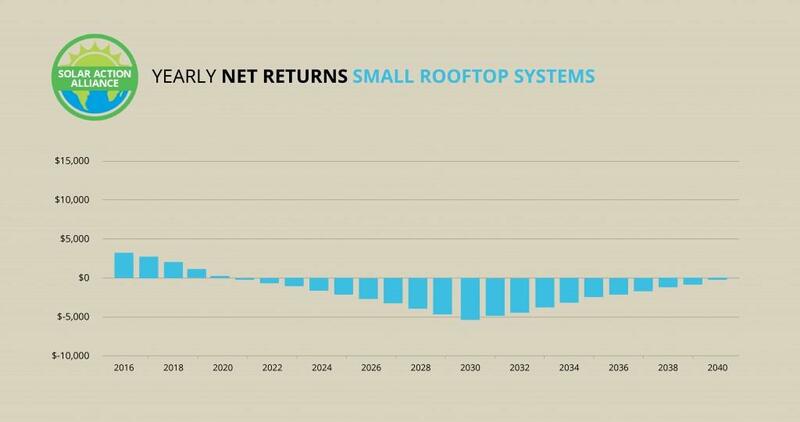 Your solar power system will almost pay for itself at the end of the full 25 years. You’ll get your 30% federal tax credit the first year, so you won’t feel a major pinch at any time. But although your monthly energy bills will go down, your loan payments (i.e., the principal plus the interest) will counter those savings. Once the loan is paid, you’ll gradually earn back your investment. So while the money isn’t enticing, think about how your solar panel system will benefit others, especially future generations. An RPS is a program that mandates the transition to renewable energy resources. Utility companies must comply with the legislation, or else they have to pay fines. Some states have actually enacted an RPS, then repealed it or switched participation from mandatory to voluntary. In Arkansas, there has never been any RPS to begin with. Unfortunately, without the financial incentives in place, many people just don’t see the value in converting to solar power. 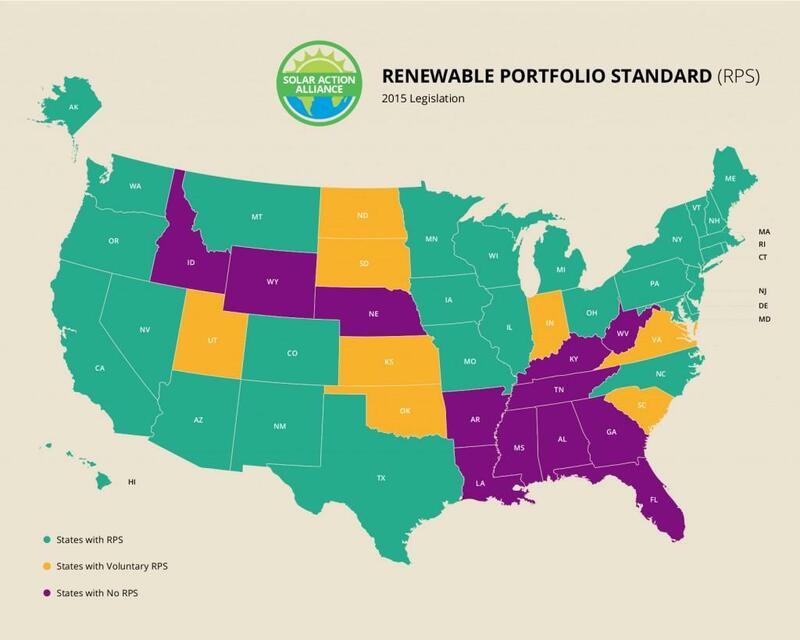 Sadly, Arkansas gets a solid F for its (un)friendliness to solar energy. For a sunny state that used to be called The Land of Opportunity, the incentives for converting to solar power are ridiculously lacking. Arkansas does at least have a net-metering program in place, which allows solar panel owners to earn energy bill credits for any excess power produced. Nevertheless, the excitement ends there, and the bottom line is that installing a solar power system in the state is costly. While going solar is a good choice for the environment, it would be nice if Arkansas offered greater financial incentives for residents looking to convert.